If you are in search of an affordable guitar effects pedal, then ME-25 from Boss may be the one you really need. There are some amazing features in this effects pedal. It has a user friendly interface and is easy to learn. Read on to know more about the features ME-25 and also its pros and cons. 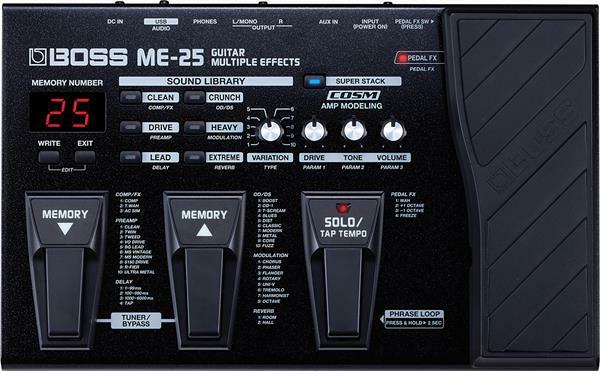 ME-25 is one of the best affordable effects pedal in the market providing high quality sound. You have the capability of organizing your sounds on ME-25 with your computer using USB cable. It is equipped with a completely redesigned operating system which makes it easy to understand and use it even if you are a beginner in the field. There are 60 user patches and 60 factory patches for instant access. You can tweak the user patches to get the exact sound you want from the pedal. Let's look at the features of ME-25. This technology helps to simulate classic instruments and effects. You can use it to recreate the sounds of most amplifiers accurately. Physical characteristics of the high end amplifiers are analyzed to create these amazing sounds. It has two pedals for navigating through the memory bank of sound patches. When you press both the memory pedals you can enter into the Tuner/bypass mode where you can tune your guitar. You can also bypass this effects pedal with this mode. Tuning with ME-25 is pretty straight forward. The note currently played on the guitar is displayed on the screen. A solo pedal is available to enter into solo mode from rhythm. This increases the volume of the instrument for playing solo. There is also an expression pedal for volume control, wah wah, octave up and down as well Freeze (to sustain the currently played note or chord). You can right away connect your ME-25 to your computer using MIDI USB cable. By connecting your computer to ME-25 you have the advantage of recording your performances. You can send computer's output sound directly to the ME-25. New sound patches can be downloaded from the internet and transferred to the ME-25 using the USB cable. You need to have the BOSS Tone Studio software application to do this. There are popular music sound patches from renowned guitarists in BOSS Tone Studio. You get 60 sound patches from all varieties of sounds like clean, heavy, crunch, lead, extreme, etc. You just need to select the category and choose from the 10 variations available for each category. There are also 3 more knobs for instantly tweaking the sound to your liking. The first knob is for drive, the second is for the tone and the last knob is the change the volume of the sound. You can also edit the sounds by pressing the Exit and Write buttons simultaneously. There are plenty of effects like Comp/FX, Overdrive/Distortion, Modulation, Delay, Preamp and Reverb. Phrase loop is one of the most exciting features of ME-25. It can record up to 38 seconds of audio and loop it infinitely. You can overdub new music on the loop and in this way create stunning backing sound accompaniment. You can play your favourite music along with the phrase loop that you have recorded without having to stop the loop. Headphone output is present alongside stereo output. Auxilary input is available to jam along with your favourite backing track. It can run on 6 AA size batteries or BOSS PSA series adapter. Along with all this you get SONAR LE a DAW (Digital Audio Workstation) software for free in the bundled DVD. You also get backing tracks and loops from popular musicians. To conclude, I strongly feel that ME-25 is the best guitar effects pedal in its price range. Moreoever it is developed by Roland which is a pioneer in music development since long. If you are planning to buy an affordable effects pedal for your guitar then you should definitely consider ME-25.